A recent PRRI survey shows that growing religious differences between seniors, America’s oldest adults, and Millennials, America’s youngest adults, are dramatic. More than 7-in-10 (71%) seniors identify as some type of white Christian, including white evangelical Protestant (29%) white mainline Protestant (23%), or white Catholic (17%). In contrast, less than 3-in-10 (28%) of Millennials identify as white Christian (10% white evangelical Protestant, 9% white mainline Protestant, and 6% white Catholic). Seniors are about three times more likely than Millennials to identify as white Catholic (17% vs. 6%). Conversely, Hispanic Catholics make up a much larger proportion of Millennials (10%) than seniors (3%). Among Americans under the age of 30, the majority (56%) of Catholics are now Hispanic. Another important religious difference separating seniors and Millennials is the number of each who identify as religiously unaffiliated. Nearly one-third (31%) of Millennials identify as religiously unaffiliated, compared to roughly 1-in-10 (11%) seniors. Millennials (13%) are also about four times more likely than seniors (3%) to identify as atheist or agnostic. 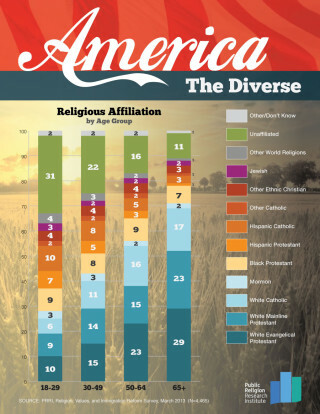 Although the Coca-Cola advertisement may have been controversial in some quarters, it is clear that the religious and ethnic landscape of America is changing to become less white, less Christian, and more diverse.